Ogilvy Public Relations' Michael DiSalvo and Ben King, account directors in the firm's New York office, competed against 17 other teams. (L to R: Disalvo, Smith, and King). 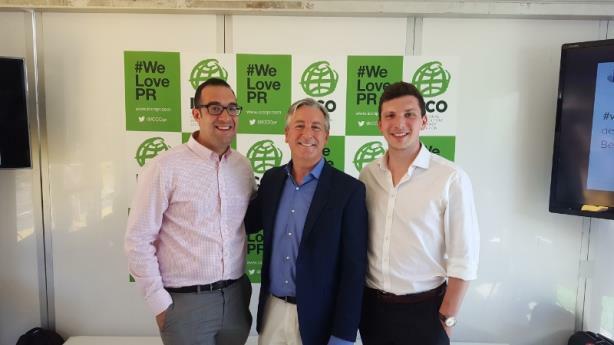 CANNES, FRANCE: Representing Team U.S.A., Ogilvy Public Relations’ Michael DiSalvo and Ben King won gold at the 2016 Cannes Young Lions PR Competition on Monday at the Cannes Lions Festival of Creativity. They are the first team from the U.S. to win the gold PR Young Lion. Disalvo and King competed against 17 teams from around the world, each tasked with creating a campaign to end food waste by retailers on behalf of the U.N. Sustainable Development Goals. The pair’s Extra Ordinary Food effort aimed to shift public perception of "misshapen, older, or excess food that is usually discarded" by partnering with beauty magazines for a "raw food fashion shoot." Its message: "good food does not need to always look perfect." "We hope it showed how PR still has the ability to change behavior and influence outcomes," King and DiSalvo said in a statement. Ogilvy PR global CEO Stuart Smith called the win an inspiration for PR pros worldwide, adding, "Creativity has never been more important to the public relations industry." The two account directors from Ogilvy PR’s New York office were selected from a field of 70 to represent the U.S. at this year’s Cannes Young Lions PR Competition for their creative pitch for the Variety Freedom Program. The winners were announced at a small event with the PR Council in late April, with the results made public about a month later. Their campaign to promote the program, an initiative of Variety – the Children’s Charity, portrayed children with special needs as comic book heroes capable of extraordinary things, who only require the proper mobility equipment to do so. Before the pair jetted off to Cannes for the international competition, Cohn & Wolfe president of the Americas and chief of integrated marketing Jim Joseph praised their campaign for being "tangible" and "exhilarating visually." PR Council president Renee Wilson highlighted that campaign’s creativity and said the most successful pitches at Cannes contain "real human truths that span across different countries and cultures." This story was updated on June 21 to include the fact that DiSalvo and King are the first team from the U.S. to win the gold Young Lion for PR.